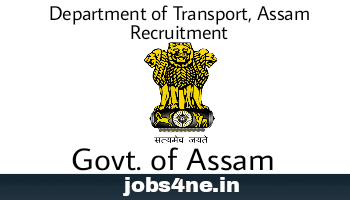 Department of Transport, Assam Recruitment 2017- Programmer, Network Engineer & Technical Asstt. Posts: Last Date 18-05-2017. - Jobs4NE : Jobs in Assam and North East India. Department of Transport, Assam Recruitment 2017- Programmer, Network Engineer & Technical Asstt. Posts: Last Date 18-05-2017. The Commissioner of Transport, Assam invites applications from eligible and interested candidates for the recruitment for the following positions for a period of one year. Last date of sending CV to email: 18-05-2017 upto 5 pm. Total no. of posts: 10 Nos. Qualification: MCA/ BE/ B.Tech in Computer Science with a minimum of 60% marks. Three years Minimum experience in software project operation and maintenance. 2. Programmer Asstt. : 3 Nos. Qualification: MCA/ BE/ B.Tech in Computer Science with a minimum 60% Marks. Two years minimum experience in software project operation and maintenance. 3. Network Engineer: 1 No. certification in networking. One year minimum experience on Network operations and maintenance. Preference will be given to candidates with experience in related sector. 4. Technical Asstt. : 5 Nos. Qualification: Graduate + one year in diploma certificate in computer software course or equivalent to DOECC O Level. PGDA from Government recognized institution is desirable. Preference will be given to candidates with expereince in related sector. How to Apply: Intending candidates must send their resumes on the following email Id transport.recruitment2017@gmail.com on or before 5 pm of 18.05.2017. No application shall be received in hard copy or through other means except through e-mail. Application received after the above date and time shall not be considered. The date of interview will be intimated to the shortlisted candidates through email only. 1. The candidates are required to mention details of their educational qualification & experience in their Resume.